closed systems imitate the pristine waters of the reef. Most protein skimmers are improperly tuned and only provide a fraction of the benefits. So if you are looking to buy a skimmer, or judge if yours is working right, here is a summary. The basic idea behind a protein skimmer is to have the finest bubbles possible suspended in the water the longest time. This allows time for the dissolved waste to coat the bubble, rise to the top, and be removed. I will use the old counter current air-driven models as an example. At the bottom of the skimmer, an airstone creates a current upwards. Near the top of the skimmer is an inlet for tank water, with the water exit at the bottom. The trick is to get the bubbles to remain suspended, but not be pushed out the bottom, by adjusting the amount of water flowing downwards. This allowed for the maximum coating of the bubbles, and maximum density of bubbles in the skimmer. Venturi skimmers are a way of injecting air into water. The idea is like that old straw trick we annoyed our parents with. Blow across a straw that is in a cup of water, and presto, you have a projectile spray and a waiter cleaning up a mess. Venturi inlets just reverse this and use a stream of water to draw air in. These are very effective, although you need to see that the design allows for the air/water mixture to remaining in the skimmer tube until saturated. This includes swirling the mixture to maximize tube length, sending it through a byzantine maze to maximize space, or utilizing the countercurrent design mentioned above. Venturi designs have improved by reducing the size of the bubbles injected, as in the needle wheel and downdraft technology. Needle wheel skimmers have air injected before the pump where the bubbles are chopped finely by the custom impeller. These are very effective and produce a very dry foam. Downdraft skimmers send the air/water mixture through a tube of bio-balls to break apart the bubbles and maximize contact time. When you have your skimmer set up, you will want to adjust it for your tank. Overall, an adjustment will probably be a matter of raising or lowering the air/water mixture level in the skimmer. If you run your skimmer and you are getting a brown residue in the tube but not in the cup, you need to raise the level of the air/water. This is done by either opening the valve to let more water come in from the pump, or if your pump is maxed out then you need to restrict the amount of water coming out of the skimmer. If you are getting a lot of clearish, watery looking foam in the cup, then you can lower the level of the water/air mixture so that the foam takes longer to build up then overflow. Please make small adjustments at a time, and let your skimmer run for a few hours before adjusting more. This is important because you skimmer will skim differently depending on the surface tension of the water. Depending on your feeding schedule or the time of day you skimmer may be making larger bubbles one minute then foaming over the next. Even the oils on your hand can make the water tension fall and the skimmer will not skim for a few minutes or hours. 1. 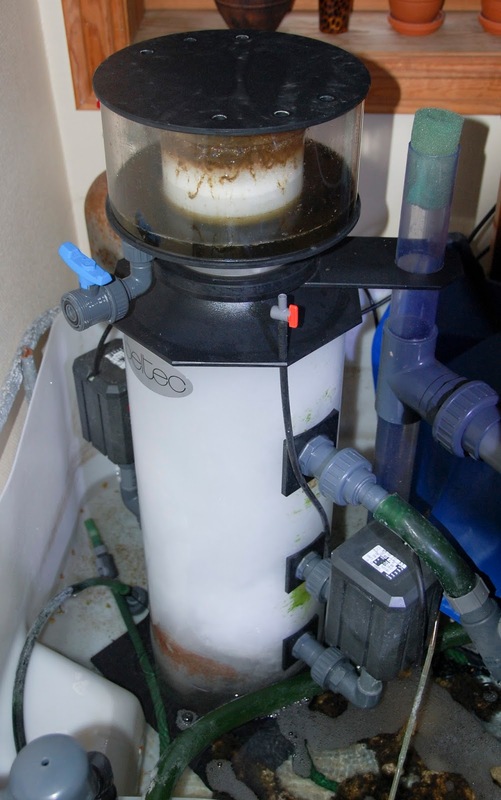 The protein skimmer can remove the organic wastes almost as soon as they are formed in your aquarium. That means you are able to eliminate them before they are disintegrated by the bacteria in the tank into a nitrogenous matter. Nitrogen in the tank can be harmful, as it will interfere with the properties of the water and even get converted into toxic forms that could be life-threatening to the inhabitants of the aquarium. 2. If you are continuously removing the organic protein wastes from the aquarium with the skimmer, it is obvious that the aquarium will not require frequent water changes. 3. Apart from the protein wastes, the protein skimmers are also capable of removing fatty substances that collect in the tank and some carbohydrates. Even organic molecules containing elements like copper can be eliminated. How do you choose a Protein Skimmer for your Aquarium? But, though a protein skimmer is a very essential device, it is also one of the most expensive additions that you will make to your aquarium. That is the reason why you should buy the most suitable skimmer, as it will be a one-time expense you will make. A good protein skimmer will also be durable and will be with you for a long time. Here are the different types of protein skimmers that are available in the market. You can decide what to buy after understanding the types available. 1. Co-current Protein Skimmers – Co-current protein skimmers are called so because here the water from the aquarium is made to move only in one direction (upwards), and the bubbles move along with the flow of the water. The exchange of wastes is done between the water and the bubbles as both moves towards the top, side by side. 2. Counter Current Protein Skimmers – In counter current protein skimmers, the bubbles move downwards for a while as the water moves in the upward direction. The bubbles move downwards for some time, till the exchange takes place and then they take the waste matter to the cup on the top. The advantage is that the counter current mechanism facilitates for better contact between the dirty water and the bubbles and hence more effectiveness. 3. Circulating Current Protein Skimmers – These are a new development, in which the mechanism is the same, but the water is made to enter into the protein skimmer a number of times through a circulating device. This increases the time of contact and ensures a high degree of purification of the water. Your choice of a protein skimmer will certainly depend upon the type of aquarium and the budget. The co-current protein skimmers are the cheapest, and they are quite effective for small size freshwater and saltwater aquariums. Prices are high for the counter current variety, and the circulating ones are the costliest. But it you have a very large aquarium, like the ones they keep in commercial places, you will need a powerful protein skimmer. In such cases, counter current and circulating current protein skimmers become essential.